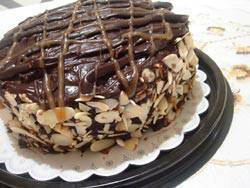 No need for an occasion to enjoy a slice of this choco-caramel heaven. Up until recently, I’ve only used the Chocolate Cake with Fleur de Sel Caramel Filling and Dark Chocolate Ganache recipe by David Lawrence of Goodbite.com for its excellent caramel recipe, which I fill my Lemon Vanilla Caramel cake with. A few days ago, I decided to go ahead and follow the recipe to the letter, except replacing the posh, hand-harvested sea salt, “Fleur de Sel,” with regular iodized salt, and also holding off on the generous sprinkling originally called for. The result: a beautiful, moist, decadent chocolate bomb that was easy on the tooth (not too sweet) and perfectly-textured with a wall of crunchy toasted almonds in the background. It's truly delightful especially when paired with a cup of coffee. My only issue with this recipe—or any recipe that calls for different types of cocoa, powdered and otherwise—is the availability of good baking chocolate in Manila. The common denominator among home and small-business bakers seems to be the famous Chocolate Lover store where one could get huge hunks of bittersweet, semi-sweet, and other varieties and percentages of chocolate. As much as I enjoy the flavor, friendly prices, and availability, I seem to get a headache whenever consuming their product. But I have yet to do a taste-test and experiment of sorts to validate this observation, so don’t take my word for it (or kindly leave a comment if you’ve experienced the same thing). Assuming this ‘headache’ correlation were true, I am left with the premium baking chocolate at Santi’s Delicatessen (around P300 per 500-gram block) or pricey Baker’s, Nestle, Hersheys, and Ghirardelli from the grocery (ka-ching!). Talk about giving your wallet its own migraine! 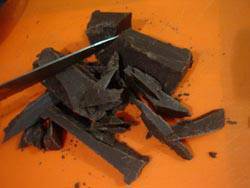 Anyway, that aside, chocolate cake—whatever cocoa product it’s made with—will be a perennial, year-round fave. What better way to cap a crisp summer meal with a glass of cold milk and a slice of gooey ganache cake? Or when it’s cooler outside, say up in Baguio in the "ber" months, a belly-warming tandem of cake and hot cocoa? And how about a cup of espresso to highlight and enhance dessert time even further? For all of the above reasons, and perhaps even more, I am definitely keeping this cake in my recipe repertoire. And I’m only happy to share it with you. Begin every chocolate cake recipe with the best chocolate you can find and afford. 2)…But make the same amount of caramel because you can use it for other desserts, or even drizzle it over pancakes! 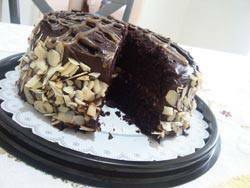 3)This cake is very chocolatey, and therefore, quite messy to make. Have plenty of paper towels ready! Silky chocolate ganache and smooth buttery caramel are fun to make. Both keep well in the refrigerator.